Anthuriums are interesting, lesser known plants. They’ve been undergoing a lot of breeding and cultivating recently, though, and they’re starting to make a comeback. The comeback is well deserved, as the flowers have a unique look and low maintenance requirements, particularly when it comes to water. 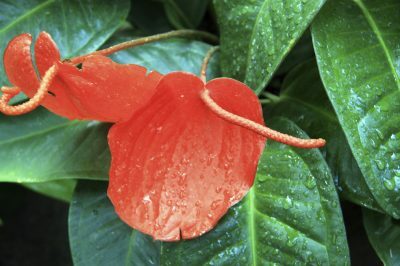 Keep reading to learn more about anthurium water requirements. Anthuriums are slow growing plants that produce flat, spade shaped leaves and strange, colorful flowers. The most noticeable part of the flower is the spathe, which is actually single leaf that ranges in color from milk white to deep burgundy. Rising above the spathe is the spadix, a tall, narrow spike in varying colors that is the actual flower. Watering anthuriums is easy, though a little counterintuitive. Although they’re tropical plants that thrive in high humidity, anthurium water requirements are very light. Anthuriums have big, fleshy roots that rot easily in waterlogged soil, so they really only need to be watered once a week or so. You’ll know when to water an anthurium if you allow the soil to dry out noticeably first. 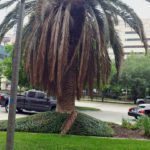 Once the topsoil is dry to the touch, give it a good watering and leave it alone until it’s dried out again. That being said, you can’t completely do away with watering anthuriums. If the plant dries out too much, the tips of the leaves will start to yellow. One good way to work with anthurium water requirements is to hold off on repotting the plant. 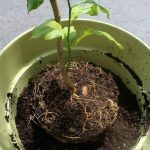 If your anthurium becomes a little bit root bound, its container won’t retain as much water and the plant will actually benefit from it. 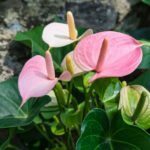 You don’t have to worry about hurting it, as anthurium is one of those plants that actually does better when left a bit root bound.